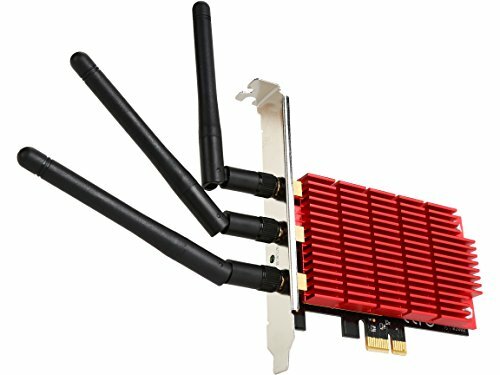 • Fastest Wi-Fi Standard:RNX-AC1900PCE uses Broadcom's new generation WiFi 802.11ac chipset to reach ultra-speeds of up to 1300Mbps at 5GHz band, which is three times faster than 802.11n WiFi speed. Simultaneously, it maintains full backward compatibility with all previous WiFi standards. • Extraordinary WiFi Speed:With wireless speeds of up to 1300Mbps+600Mbps and advanced MIMO technology, RNX-AC1900PCE provides a fast, reliable wireless connection for lag-free online gaming and video streaming. It achieves the best performance with wireless 11AC devices, but also works seamlessly with existing WiFi networks. • A Card for all your need:RNX-AC1900PCE allows to connect with a 2.4GHz or 5GHz network. It allows users to experience better ultra HD video streaming and online gaming in the 5GHz band, and to use the 2.4 GHz band for simple tasks such as sending e-mails or website browsing to meet all your internet need. • Efficient Wi-Fi:RNX-AC1900PCE supports the latest Beamforming Technology which intelligently strengthens wireless connectivity with precise directional signal amplification for extended coverage, increased data-throughput speed, and enhanced stability. • Wider Range with High Gain Detachable Antennas:Three Detachable dual band antennas create optimally tuned and wider wireless coverage. With upgradable antennas, RNX-AC1900PCE can provide the perfect placement for ultimate reception and the highest quality WiFi networking. • Stylish Aluminum Heat Sink:The advanced heat sink uses high-density aluminum to dissipate heat from the chipset, ensuring the reliability. Lower temperatures turn into a more stable connection in all climate conditions and well-designed ventilation maintains perfect performance at its highest level. If you have any questions about this product by Rosewill, contact us by completing and submitting the form below. If you are looking for a specif part number, please include it with your message.